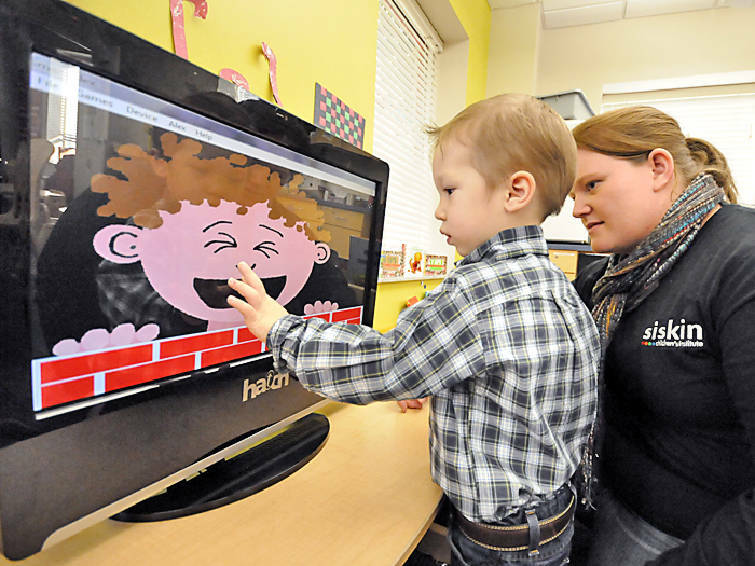 Johnathan Castro, 2, uses a touch screen to help him understand emotions in the ESCALATE Class at Siskin Children's Institute. His teacher, Molly Sloan, watches his actions as the screen changes faces. Up until 18 months of age, Johnathan Castro was a typical babbling toddler, adding word after word to his budding vocabulary, from "banana" to "juice" to "Daddy." But at 18 months, a sudden reversion to silence worried his mother, Kris Castro. "I knew there was something wrong. He want from having a 15-word vocabulary to not talking at all," she said. Johnathan was diagnosed with autism at his 2-year checkup in August. Soon after, the family moved from Spring City, Tenn., to Chattanooga to enroll in Siskin Children's Institute new ESCALATE program. ESCALATE stands for Engagement, Social, Communications and Learning Approaches to Toddler Education. It helps families with young children who have been diagnosed with or show signs of autism. It is supported by $415,000 in economic stimulus funding. The program includes an inclusive classroom setting at Siskin Children's Institute and weekly home visits, said Robin McWilliam, director of the Siskin Center for Child and Family Research and program creator. An early intervention expert helps parents or caregivers learn strategies in their home to help address the child's problem behaviors. They focus on social, language and play skills and how to participate appropriately in daily routines, McWilliam said. Therapists also work one-on-one with children in a classroom with other typically developing students. "Our approach here is to make children's and families' experiences as normal as possible," McWilliam said. "This is true inclusion of children with autism with children without disabilities. ... The vast majority of programs are secluding children to disability classrooms." Money for the program came through the state Department of Education's Tennessee Early Intervention System, which helps families of children through age 2 who have disabilities. Jamie Kilpatrick, director of the Office of Early Childhood with the Education Department, said the project should provide important information about how to best engage very young children with autism. "There's simply not a lot of research and evidence about what's the best way to serve these children," he said. "We're trying to look at this as a demonstration approach. We think we're going to be better informed long-term based on this project." The number of children diagnosed with autism has grown in recent years. The U.S. Centers for Disease Control and Prevention says an average of 1 in 110 U.S. children has a form of autism. For Johnathan, the effect of just a couple months in the program has been noticeable, Castro said. "He still doesn't make a whole lot of eye contact," she said. "He's still not talking, but he's running around the house working on his consonants and using imaginative play. ... It's a wonderful feeling." Contact staff writer Emily Bregel at ebregel@timesfreepress.com or 423-757-6467.